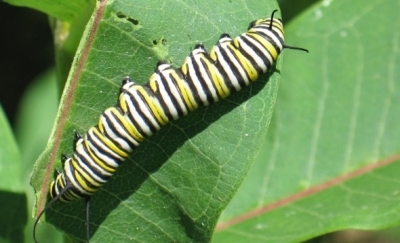 Macdonough School has been awarded a grant to create a Monarch Recovery Garden and habitat at our school. Amy Waterman from our Family Resource center and myself attended a training and are going to be working together to help make this dream come true. Follow the progress on the STEM blog page Pollinator Garden Project to see what our students are working on and learning about as they help make a change for the better. The STEM students have been working on a website about endangered animals. They have been researching, note taking, writing, editing and revising to prepare their web page about an endangered species. Click on the button below to visit the site. Fifth Grade students made videos demonstrating the properties of multiplication. Click on the links below to view them. Fourth grade STEM students used their iPAds and factor rainbows to find factors. They also identified numbers as prime or composite. Fifth grade STEM students are exploring the associative, zero, identity, commutative, and distributive properties of multiplication. They created videos to help others learn. Fourth and fifth grade students are competing in The Stock Market Game. They are learning about investing and how to find information about stocks. Using a Google Form they are entering what they learn about a stock and sharing it with everyone in the class. They are creating their own database to use to help them make good investments. Go to our Google Sheet to view their work by clicking on this sentence. Fourth grade students are practicing the use of their iPads, responsible blogging, reading, and reflection using Tween Tribune, a Smithsonian website that provides non fiction articles on current events. You can visit Tween Tribune at http://tweentribune.com/accounts/login/ and our Kids Blog at https://kidblog.org/class/fourth-grade-stem-at-macdonough-school-2015-16/posts. Fifth grade STEM students are using their iPad minis to read A Long Walk To Water and post comments on our blog page. To see their responses and ideas go to https://kidblog.org/class/fifth-grade-stem-at-macdonough-2015-16/posts. This week in STEM we will be settling in, discussing expectations and SURFS behavior and learning the ropes. All of our STEM students have started using their Google Drive and Google Classroom. Both fourth and fifth grade students received their first Google classroom assignment. They are researching and taking notes to get background knowledge for their Scotties Trees Rocks Video. We have covered organizing notes using Google Docs. They will be creating a video for the contest that tells why trees are important. All students have started using xtramath.org to practice their math facts and we will soon be setting up teams for The Stock Market Game. We will be learning investment basics and each team will have $100,000 to invest. This is a year long project where students will have to review their investments and make decisions based on information and research. Fifth grade students will be taking iPads home to read "A Long Walk to Water" as part of their literature circle. Fifth grade has also started measuring the STEM room in metric measurement and they will be building a model using the 3D printer as part of their place value unit. 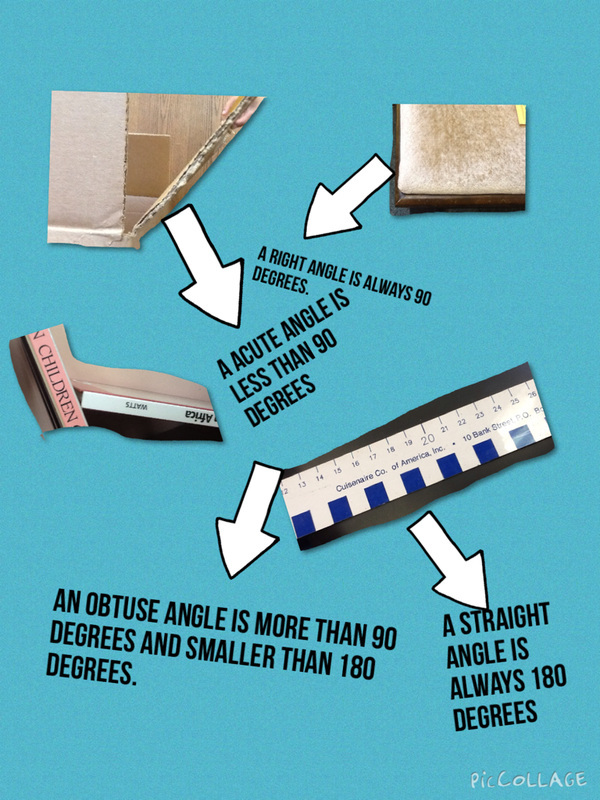 Fourth grade STEM students went on a scavenger hunt with their iPads to find angles. 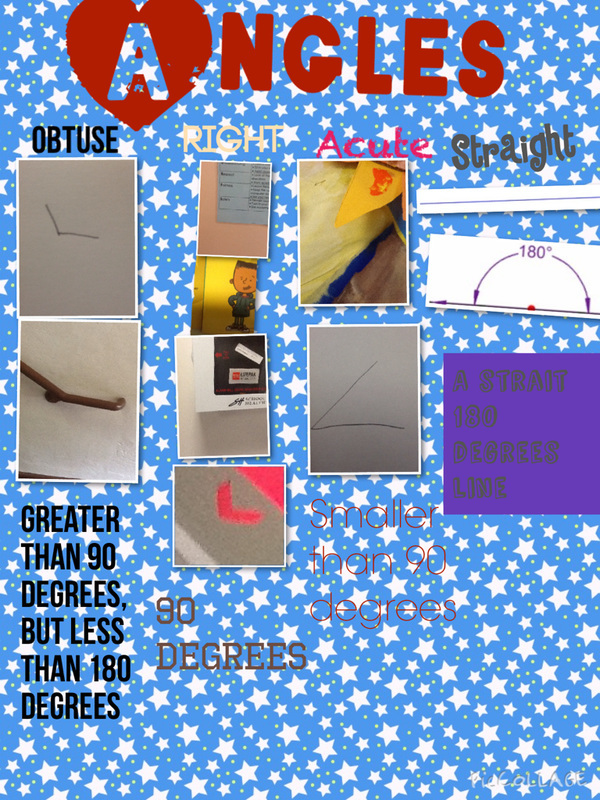 They then created a pic collage of what they found, labelling and defining each angle. Below are a few examples of their finished product. 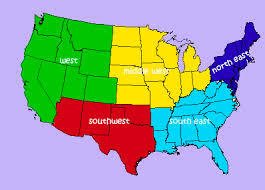 What region is best for me. Fourth grade STEM students have been studying the regions. They then wrote an expository essay telling what region they would choose to live in and including main ideas and details supporting why this is the best region for them. Fifth grade STEM students are studying the events that led up to the Revolutionary War. They are looking at the British as well as the American point of view of the issues that led to the birth of our nation. 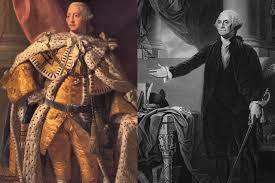 They will then be assigned a side to defend, Loyalist (British) or Rebel (American). They will debate each other while creating videos defending their sides point of view. Let the battle begin! Blogs are a wonderful way to share ideas, opinions, and to learn how to respectfully communicate on the web. Click on the picture below to visit our fourth grade blog and see what ideas our students have. ﻿Our fifth grade STEM students are trying something new. They are going to post on a blog every day for a month. The post will be about a positive experience they had. The goal of doing this is to start a habit of looking back and reflecting on things that happen. Click on the picture below to visit their blog. 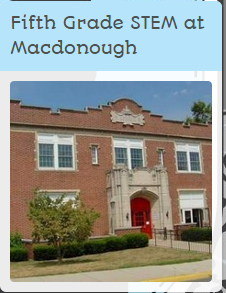 Fourth grade students learned about Thomas Macdonough. They researched using books, the Internet, field trips to the historical society and cemetery, and an interview with Thomas Macdonough Russell, a descendant of Thomas Macdonough. After all this research they developed a web sight. Check it out by clicking the picture below. 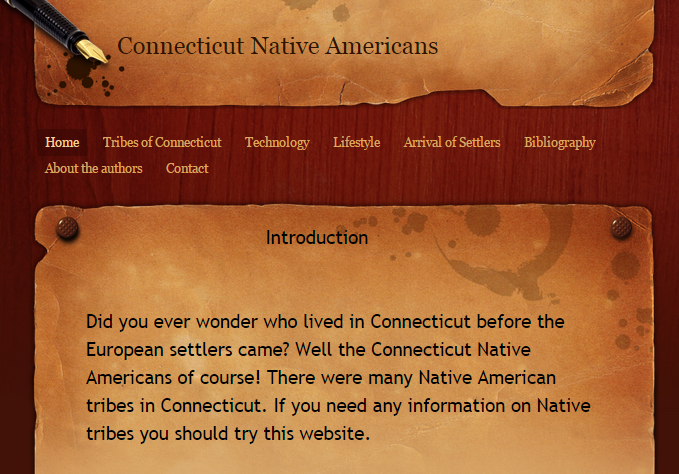 Our fifth grade students studied Native Americans of Connecticut and then collaborated to create a website. Through this experience they practiced note taking, writing, editing and revising, and how to publish their work electronically on a the internet. Over the past few months our fifth grade STEM students have been working with Kristen Palmer from Oddfellows Playhouse creating their own plays. They are having a play reading today and actors from fourth and fifth grade are reading parts in each child's play. 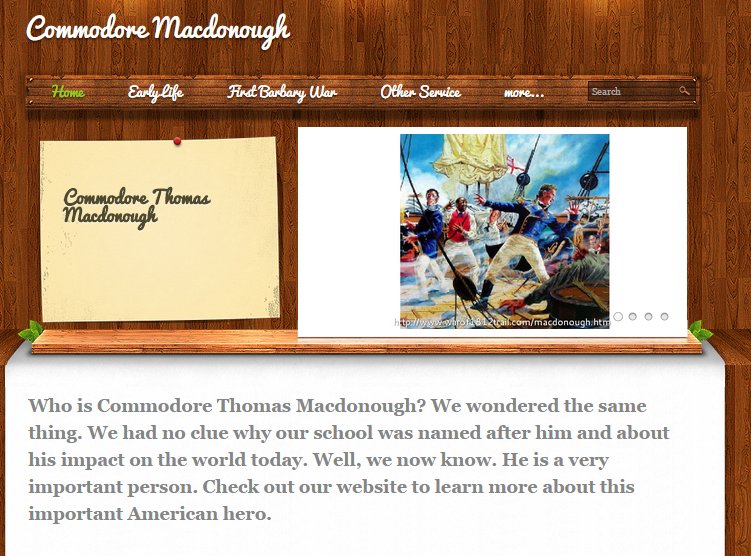 Who was Commodore Thomas Macdonough? As an extension to Middletown's second language arts unit, our fourth grade STEM students are working on a research project on Commodore Thomas Macdonough. Our school is named after him and they wanted to know why. They have learned about his accomplishments and why he is so important to both Middletown and our nation. They have searched the internet, read, and have taken notes. They were able to interview Thomas Macdonough Russell, a descendant of Commodore Macdonough. We will also be visiting his grave site and the Middlesex Historical Society. Students will take what they learned and create a webpage to share their information with the world! Our students are learning about investing by participating in The Stock Market Game. They are working in teams to research stocks and come to an agreement on what to invest in. Each team starts with $100,000 dollars. Whoever has the greatest gain in April has a chance to win on the state and national level. Our STEM fourth and fifth grade students have been working on a project for a contest. They are creating videos that tell why trees are important to them, their school, and their community. They studied and learned about trees, then they chose what information to include in their videos. Next they chose a format to present their information such as a song, poem, newscast, or play. They wrote their scripts, edited and revised their work until they were satisfied with it. After that they created a story board to plan what is happening in the video and finally the created their videos using various programs and apps including Garage Band, Imovie, Explain Everything, and Chatter Pix. Updated-Below are the videos that our students created. One of our videos was a national finalist in the Scotties Trees Rock Contest. 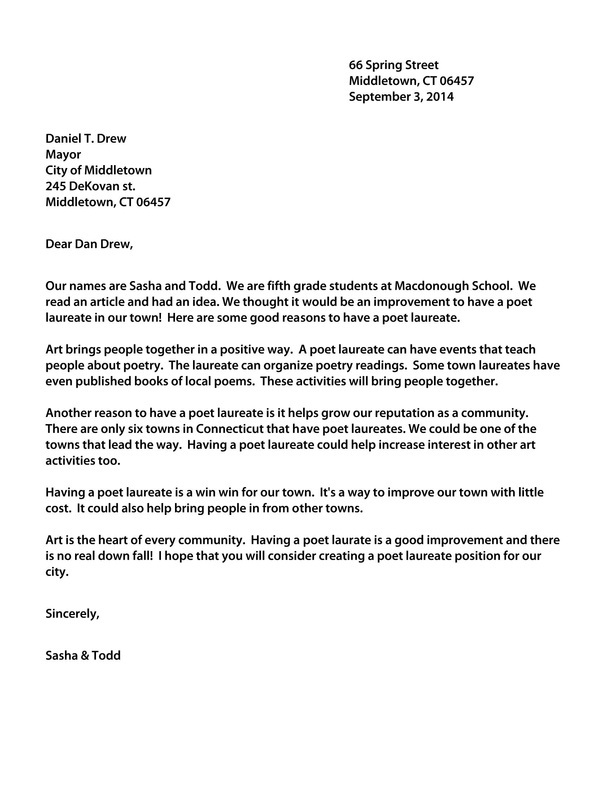 After reading an article about how several communities in our state have poet laureates, 2 of our students decided that it would be great it Middletown had its own laureate. They wrote the letter below and sent it to the mayor. They will also be speaking in front of the Middletown Art Commission this Wednesday.